I had been attuned to the weather like a sailor for weeks. The much anticipated morning arrived drizzly and gray. But it was my hope that in true Arizona fashion, the sun would melt away the clouds and leave a cool, clear day for our hike. Driving to the Canyon, a fine mist covered our windshield. By the time we reached the Backcountry Office, the rain forced us inside to finish getting our gear ready. It would require two bus trips to get to the trailhead since we had missed the last Backpackers Express. The rain had stopped by the time we reached the trailhead. 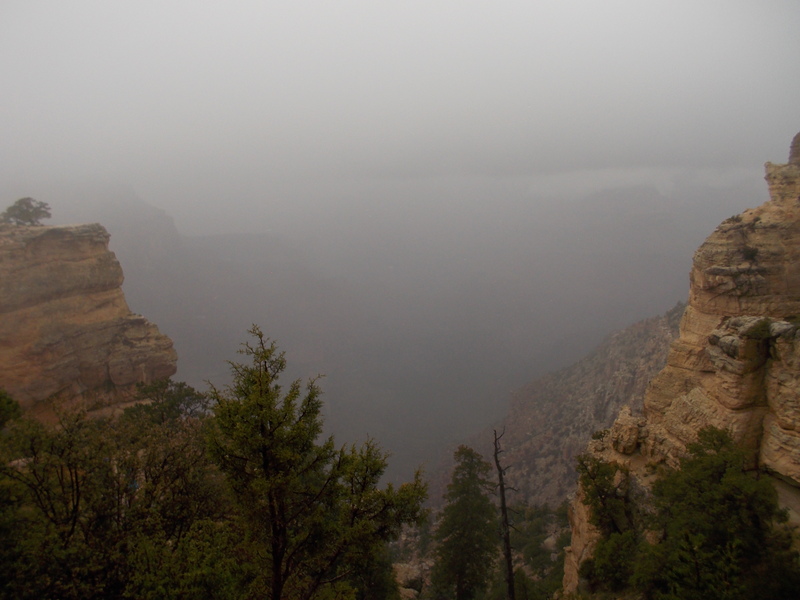 The canyon was filled with clouds which was a rare treat for me. But I couldn’t help feeling sorry for first-time visitors who only had that one day to spend at the canyon. They were going to miss the spectacular views that attract people from around the world. 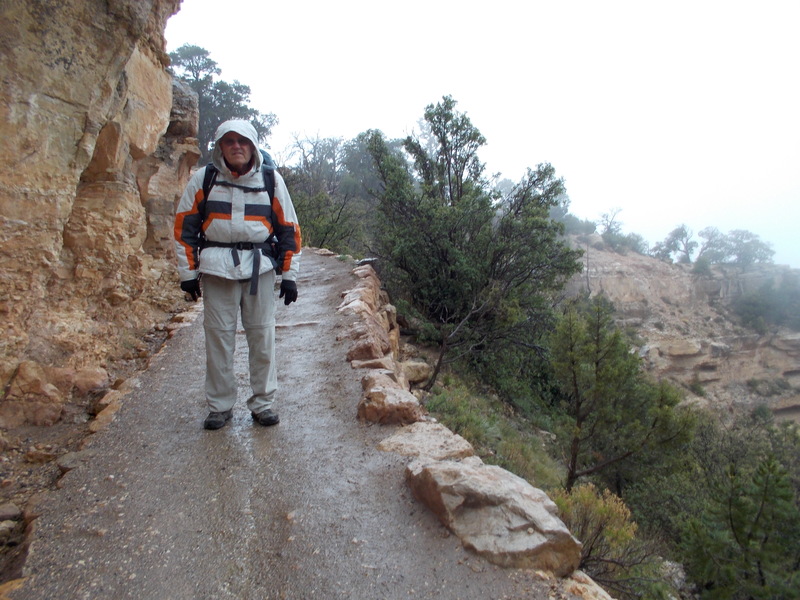 We had gone down several of the switchbacks at the beginning of the South Kaibab Trail when I noticed that Craig did not have his walking sticks. Our son, Mike, had seen some walking sticks leaning against the restroom at the trailhead. He offered to go back and see if they were still there. In the meantime, the rest of our party pressed on down the trail. 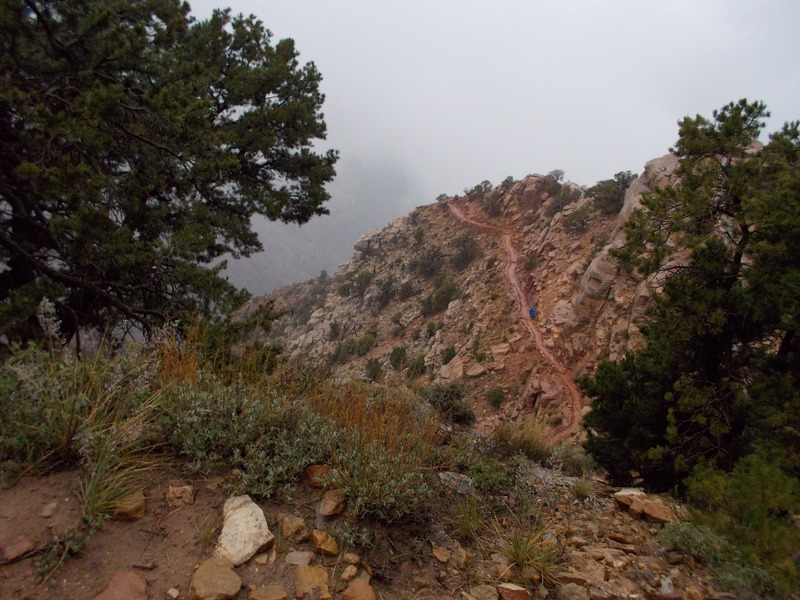 After the switchbacks, the trail became rougher and was at a more severe decline. To make matter worse, large pools of water had collected behind little rock dams all along the trail. Mike caught up with us again–without Craig’s walking sticks. In spite of the weather and the sporadic showers, I was enjoying the hike, stopping occasionally to take a picture. It was at one of those stops, about one and a half miles down, that I looked back to find Craig flanked by Mike and his wife, Vikki. Craig was walking slowly, stumbling at times, and occasionally getting dangerously close to the edge. It was apparent to everyone in our party as well as perfect strangers hiking near us, that Craig was not capable of safely finishing the remaining five miles let alone the nearly ten-mile hike that would be necessary to leave the canyon on Monday. There was nothing to do but help him get back to the rim. Mike went part of the way with us, carrying Craig’s pack. Once we reached the switchbacks, he left us and returned to finish the descent. Craig and I made our way slowly up the switchbacks that had seemed so easy to climb down. Once we reached the rim, we rested for a few minutes and then boarded the first of the two buses for the return trip to our car. On the second bus, I was chatting with some other passengers about our experience. I had just told them that Craig had lost his walking sticks, when I realized I no longer had my sticks either. I had left them on the previous bus. The bus driver used his radio to determine that my sticks were on bus 6. I would have to reconnect with bus 6 in order to get them back. Reaching our car, we threw our packs into the trunk and walked to the Bright Angel Lodge. There was no need to eat the peanut butter and jelly sandwiches I had packed for our lunch. Cold, wet and tired, we were going to enjoy a nice hot meal before going home. We spent the afternoon retrieving our walking sticks–Craig’s from the Backcountry Office and mine from Bus 6. While we were waiting for Bus 6 to return to the Visitors Center, it began to snow. In the ten minutes we were away, our car was totally covered with the white stuff. It was necessary to run the defroster for a while before it was safe to drive. Later, we would pass a snow plow headed for the canyon. On our drive home in the rain, I contemplated whether we were ready to check in to the Las Fuentes Senior Home. But during the two-hour drive, I concocted a new plan to conquer the canyon. This one is much less ambitious than my original plan. 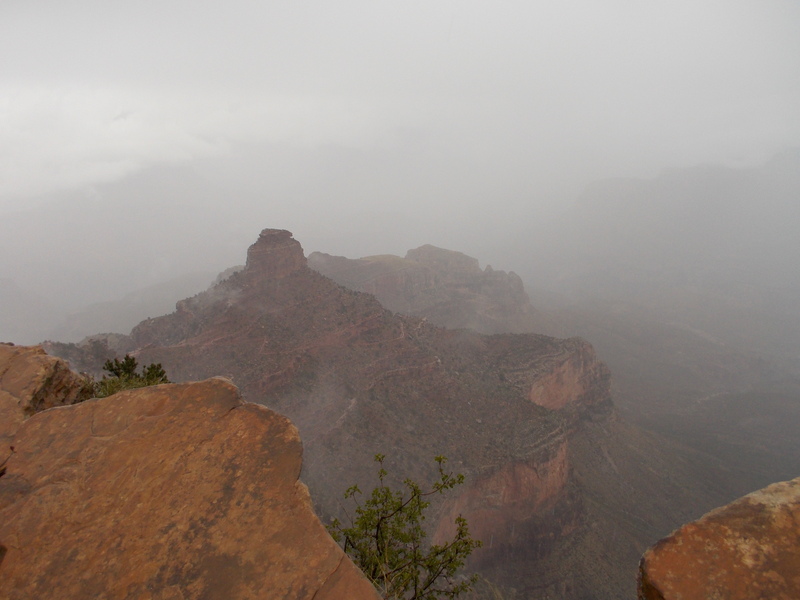 It involves camping at Indian Gardens, which is only 4.5 miles down the Bright Angel Trail. Having some of my gear brought down on a mule is also under consideration. I’m not sure who will go with me–maybe some friends or my grandkids. Sadly, Craig’s canyon hiking days are over.